It warned the typhoon would bring a storm surge that is likely to bring flooding in low-lying areas. That will put Lantau’s Tai O and beachfront properties on Pui O Beach and Lower Cheung Sha at risk. The Weather Underground tracking map (left), compiled from local and international weather agencies, shows most agreeing. The US, China and Taiwan agencies all predict the typhoon will pass to the northeast. Japan and Korea forecasters expect it will pass over the Kowloon Peninsula. 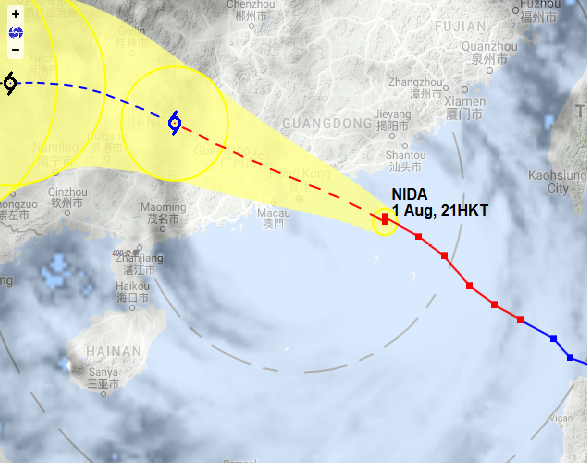 Twenty four hours ago most expected Nida to make landfall on Lantau. According to the HKO, at 9 pm Monday Nida’s centre was about 220 km east-southeast of Hong Kong and was moving at about 25 kmh east north-east. 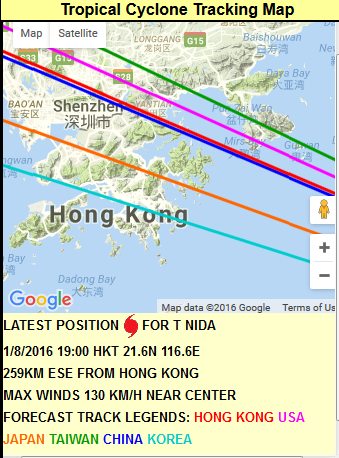 According to the present forecast track, Nida will be rather close to Hong Kong tonight to tomorrow morning. Its centre will skirt within 100 km to the northeast of the territory. The Number 8 Gale or Storm Signal is expected to persist tonight and most of the time tomorrow morning. Squalls, heavy rain and rough seas will progressively affect Hong Kong. Storm surge brought by Nida may cause flooding or sea water intrusion in some low-lying areas tomorrow morning.